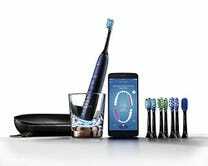 The Philips Sonicare DiamondClean attempts to fix the biggest problem with every other electric toothbrush: The person operating it. It’s good then the app is amazing, and changes the toothbrushing game if you actually use it. The Connected app tracks where you’re brushing (and not brushing), how long you brush for, where you’re using too much force, and more. The app will also keep track of when you need to replace brush heads, and your dentist can even use the app to view your brushing data and make notes of where you need to make changes. 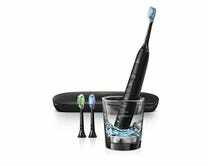 In terms of the brush itself, you get basically every feature under the sun—this is the top-of-the-line in the Sonicare family, after all—including that awesome wireless charging cup. You have two options for this deal. The 9300 series, which includes three brush heads, a travel case, and a wireless glass charger is down to $165 after clipping the $14 coupon. That’s the best price we’ve seen outside of Prime Day. Or, go all out for the 9700 series for $230, the best price we’ve ever seen. That adds an extra tongue cleaning mode, eight brush heads in the box, and a travel case that runs off of USB.